I finished my new blazer and was hoping to get some photos today… alas there is no sun and it’s rained all day… blerg. In the meantime, I’m working on a dress and am having some fitting issues, and thought I’d share. Kennis from the new pattern company Itch to Stitch contacted me to see if I would be interested in sewing and reviewing her first pattern, the Marbella Dress*. To be honest, I was reluctant to sew up a pattern from a company completely unknown to me. Aside from from a handful of indie pattern lines, I’ve been drawn more and more back to Big 4 patterns. The thing is, once you sort out your standard fitting issues you can broadly apply them to a vast number of patterns. With indie patterns, you don’t always know what type of figure they draft for. I don’t like re-inventing the wheel every time I sit down to make something. However, I was intrigued by this dress because she offers different bodice pieces based on bra cup size. YES. Now Mccalls and Simplicity do have a handful of cup size based patterns, but they only go down to a B (which is their normal draft) so I still have to make bust alterations when using those. 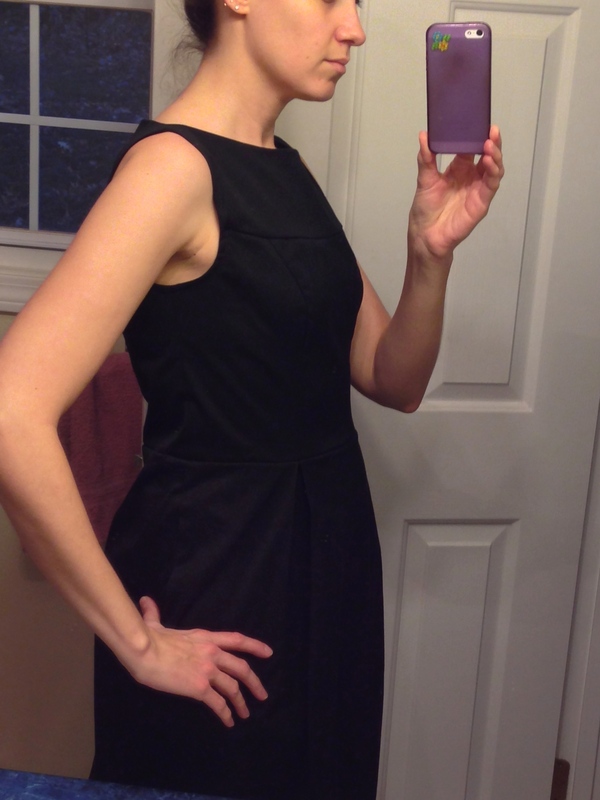 I also happened to have some black cotton sateen on hand that was a bargain buy, so if the dress worked out great! If not, I wasn’t really out much. I’m happy to report that the bodice front has a very nice fit, and the bust is perfect—did you catch that?—perfect on me. That is an absolute first. The back bodice has some neckline gape (I had to remove a full inch from center back at the top of the zip), and the overall bodice length is too long (I’ll need to take up the waist seam by 1/2″). These are fairly common issues for me, so nothing shocking there. Unfortunately, the skirt portion of the dress is problematic for me. The skirt has a tulip shape with pleats on the front, and the back is fitted with darts. Going by my measurements, I cut a 4 at the waist and graded out two sizes at the hip. The finished skirt width seemed perfectly adequate, however the distribution of the skirt width is completely wrong for me. My backside is dramatically throwing off the fit of the skirt, to the point that it’s completely unwearable as is. I know I have a curvier backside, so I went back and took my hip measurement (40″) and determined that my front hip measure is 18″, and my back 22″. That’s a 4″ difference. So here’s my question: What is a normal backside measurement? Would an 18″ front and 20″ back be more “standard”? Should I select size based on a 38″ hip then add 2″ to the back (increasing through the dart intake)? I just haven’t made many fitted skirts (for a reason!) so I’m pretty inexperienced here. Looking at the back dart, it is comically small… about 1/2″. That seems tiny even for someone with less booty than myself. Now, I do have more fabric, so I’d like to sort out the skirt problems because frankly—I like this dress. I’ll go back and take some pattern measurements, re-cut the back piece, and trim down the front side seams. However, I’m not sure if I really want the back fitted (as designed), or if I want to go tulip shaped all around (think a more subtle version of the BHL Elisalex). I’m open to thoughts on this one, but at the moment I’m inclined to alter the front skirt piece to use as the back. Looking past the current fit issues, I think this would end up being a fairly useful wardrobe addition, so I’m hoping to end up with something wearable! When I do re-work the skirt, I’ll be sure to give a more comprehensive review of the pattern. *this pattern was a freebie, given for me to review.